A Taho a day, keeps the doctor away | The Adventures of AdventuRoj! These are some of the words that I long to hear from a man walking the streets outside my window carrying two stainless vats attached to a wooden rod everyday – the magtataho. And I’m sure you’ve already heard this battle cry too at least once in your life. 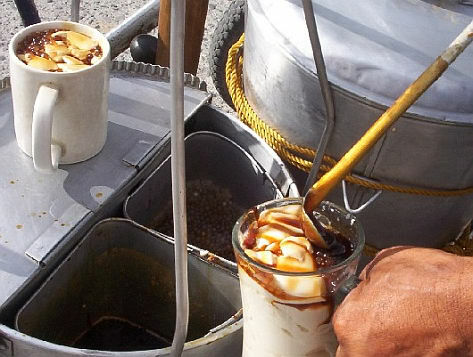 Taho, a Philippine snack food made of fresh soft/silken tofu or bean curd with sago (mini tapioca pearls) and sweet caramelized sugar syrup, is an iconic and ubiquitous street hawker food that remains popular to this day. This staple comfort food is a signature sweet and can be found all over the country. Its origins can be traced in Chinese influences, and has since become a mainstream favorite for generations. But catching a taho vendor on the road is a hit or miss thing. Ever since my health conscious times (when I was still going to the gym) until now that I’m already on a Seefood diet (I eat what I see), taho had already been part of my daily carvings. Melt palm sugar on medium heat in a small pot with a tiny drop of water. Set aside to cool to room temperature. Bring the coconut milk to the boil. If using canned coconut milk, if necessary water down with cows milk so it is consistency of pouring cream. Place the tofu on a plate then place into a steamer. Heat up tofu for a few minutes. Once the tofu is warm, remove from the steamer and serve into individual bowls. Top with coconut milk and melted palm sugar. 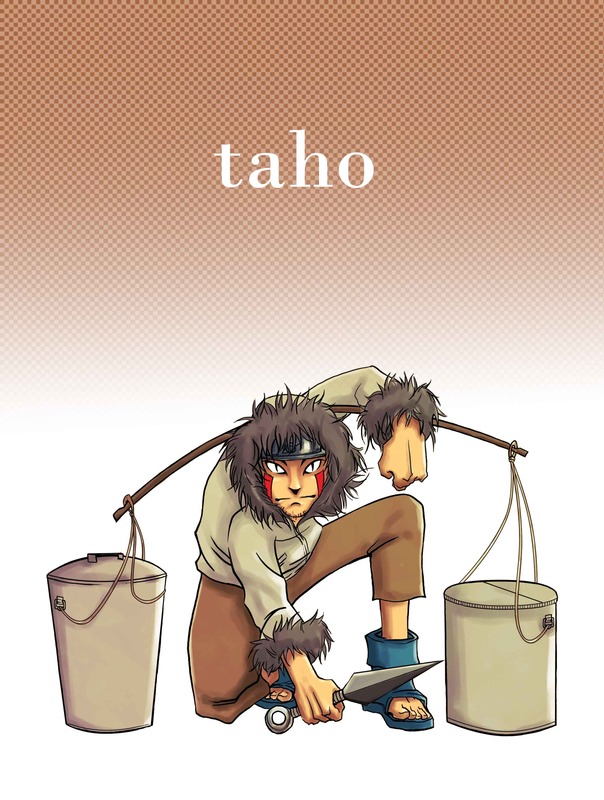 Another interesting info that I’ve found that there may be more to taho than what we think. Below is an excerpt from a study from the University of the Philippines – Los Banos by a Pinoy scientist who recently returned home from his lab in the U.S. in order to extol the many joys that soy can bring, through its health benefits. Alumni UP LB and current lead advisor for Soy Labs LLC in Missouri U.S.A., Dr. Alfredo Galvez recently gave a media talk about the Soy peptide called Lunasin, which is said to be key to having good heart health and other advantages. “In the 1990s, there were already several studies about how daily soy consumption reduced the risk of heart disease. Lunasin, which by the way, goes back to my Filipino roots, because the word Lunas means ‘solution’,” he says. When from the right plants and properly processed, Lunasin can help head off heart disease by working in the liver to carry out cholesterol synthesis and produce less cholesterol, and increasing LDL receptors to help extract more cholesterol from the blood stream, and thereby prevent plaque buildup in the arteries. “Sometimes, even a healthy diet and exercise may not be enough to prevent cholesterol problems,” he cautions. There are also ongoing studies on the effects of this soy protein in cancer prevention, wherein it can actually prevent the expression of genes that lead to the formation of tumors. Amazing isn’t it? So what are you waiting for, join me in my quest for health, aim for that daily dose of taho, and together let’s shout – TAHOOOOOOOOOOO!!!!! Hey ya! It is highly recommended to our dyslipidemic patients Roj! A very helpful discovery in health care and research. 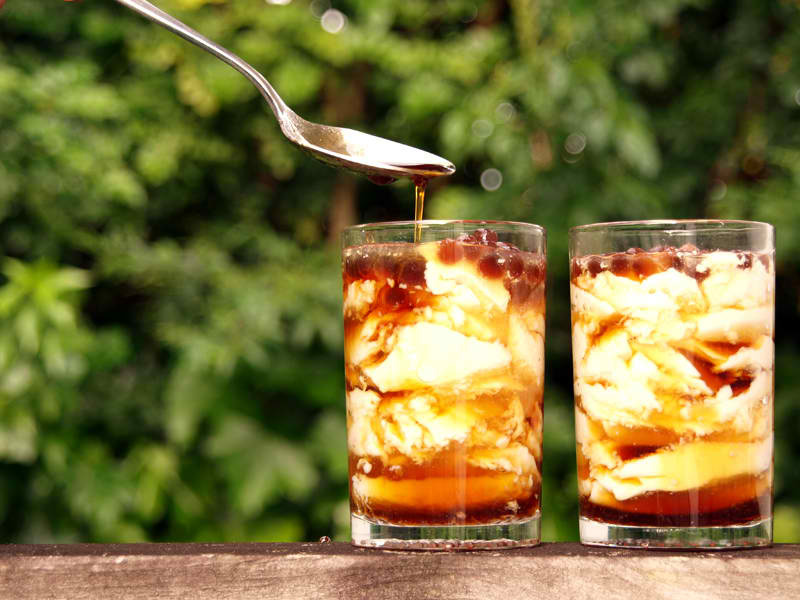 It’s about time someone wrote about taho. 🙂 Sadly, I don’t hear that “battlecry” in the morning anymore. Dunno where all the mangtataho have gone. I used to eat taho when I was a kid, but I’ve stopped since news reports that showed taho being made in unsanitary conditions. 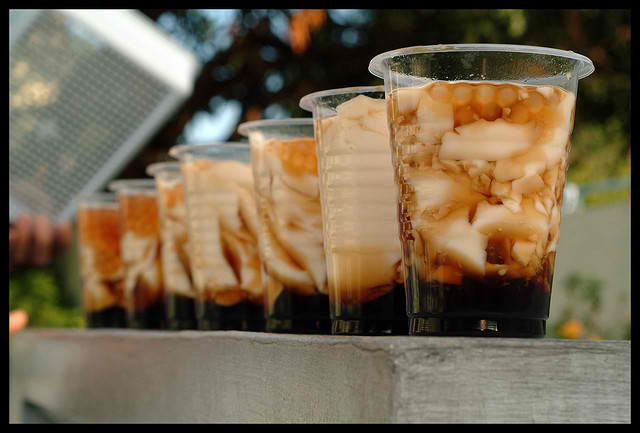 I miss taho so much ,the one being sold on the street .kakamis yung sago at arnibal na mainit init pa.
aw.. 😦 Would you like me to ask our mamang taho here to come at your place? 😉 just kidding.. thanks for dropping by! i love taho. we grew up eating taho daily. it’s also a good thing our village allows magtataho to go around the village in the morning. this is an informative post! i love taho but for awhile I couldn’t find any taho vendor around our village so i got into the frozen taho and love it too!!! knowing the health benefit is just bonus!! holidays. Today there are many clubs that replace the traditional gold clubs. Truly, imparting an appreciation and love for the game may become a significant part of parenthood. this webpage offers quality based posts.